Price fact: The price has not been lower for the the last 10 weeks. The Xiaomi RoboRock S5 is an advanced robotic vacuum cleaner with smart navigation, WiFi connectivity, and synchronous sweeping and mopping capabilities. This model has strong suction and is ideal for people who need to clean pet hair and allergens from their home. The RoboRock S5 can be controlled and scheduled with an app and features support for iOS and Android devices. Xiaomi RoboRock S5 features a long-lasting 5200mAh lithium-ion battery, with 150 minutes of constant working available on a full charge. This is longer than many other models in its class, making this vacuum ideal for big house and multi-room environments. This model works perfectly on hard floors, tiles, and low-pile carpet, although it will struggle on high-pile carpets and rugs. The RoboRock S5 comes with its own docking station and will return home to recharge when needed. This robotic vacuum cleaner can be controlled remotely with the Mi Home App, which is compatible with iOS and Android smartphones and tablets. This comprehensive app allows you to control scheduling, spot cleaning, zoned cleaning and direction control, along with monitoring and customisation. In terms of navigation, the RoboRock S5 uses laser scanning to create maps of your home. While this efficient automated cleaning solution works with little human intervention, you can also plan your own maps for total control. 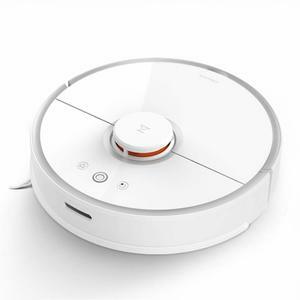 Along with its powerful 2000 Pa suction, the Xiaomi RoboRock S5 also features synchronous sweeping and mopping. This allows you to clean your entire home with one unit, with carpet, mopping, balanced, quiet, turbo, and max modes all available depending on your needs. This model is ideal for cleaning pet hair thanks to the inclusion of tangle-free technology. The RoboRock S5 is available in black and weighs 6.12 kg.